Child advocacy center CARE House of Oakland County has appointed Blythe Spitsbergen as its new executive director, effective Oct. 3. Spitsbergen, of Farmington, will replace current executive director, Pat Rosen, who will retire at the end of the year. The two will work together in a period of transition in the fourth quarter. For over 10 years, Spitsbergen worked at the nonprofit organization, Junior Achievement of Southeastern Michigan, ultimately becoming vice president for development. At CARE House, Spitsbergen will be responsible for operating the human resources department, in addition to working with the board of trustees and donors of the organization. 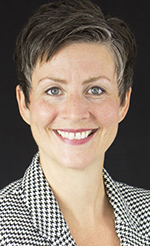 Spitsbergen received her master’s in social work in community practice and administration from Wayne State University, and earned her bachelor’s degree in social work with a minor in psychology from Eastern Michigan University.